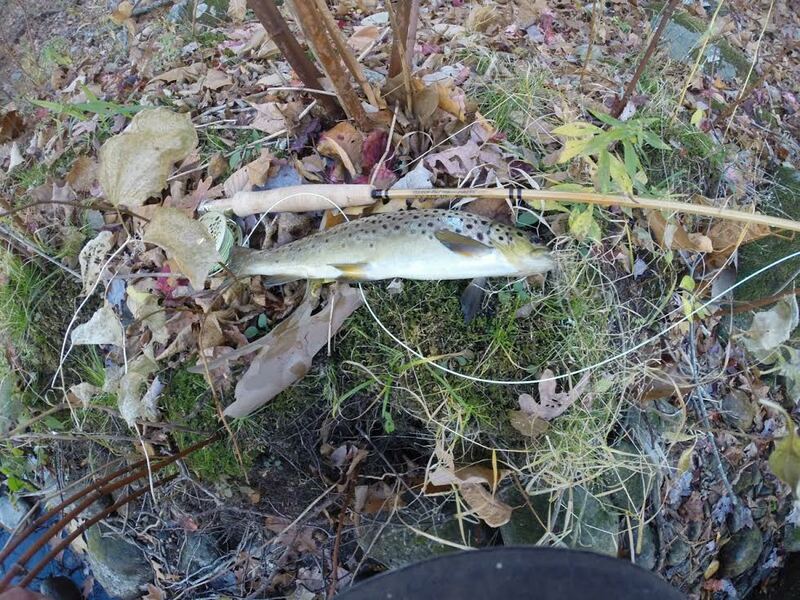 A real brute for the PA creeks. 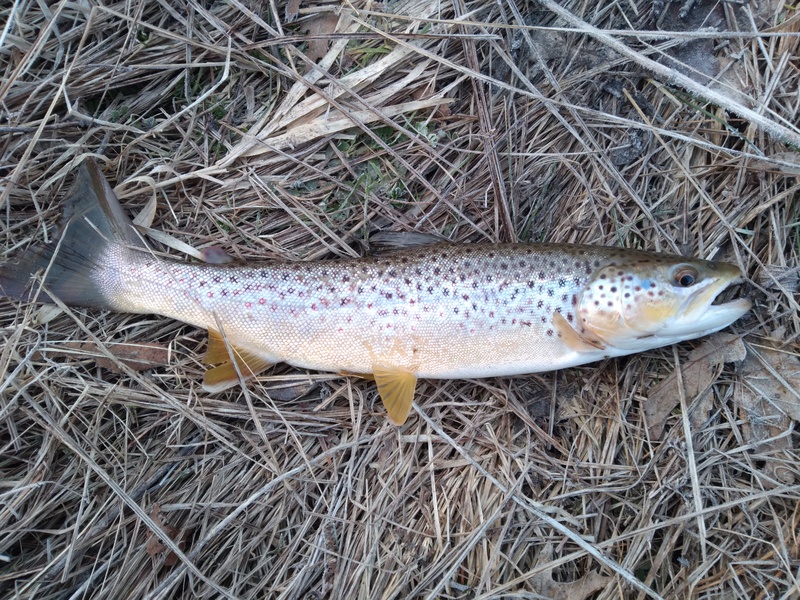 28" long and it put me into the backing in ten seconds and took me down river 150 yards from where I hooked this gorgeous hen. This is a 27" fish caught about an hour after the 28" hog. Today all my fish were hooked on a #16 Pheasant Tail with a woven Mylar wing case. 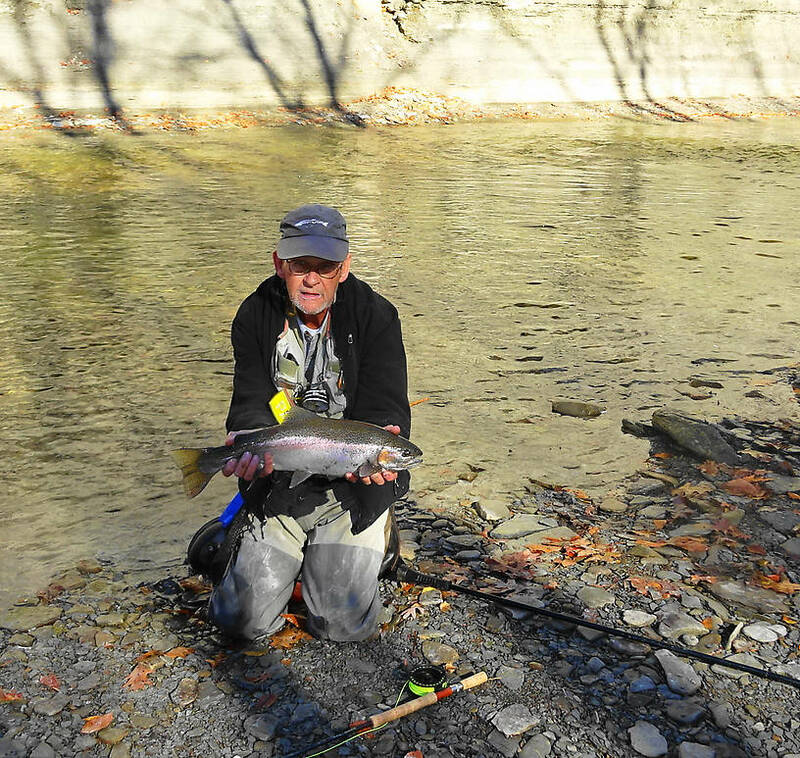 It is very exciting to see the indicator just twitch a fraction and you lift the rod tip and 6 - 8 pounds of silver muscle erupts from the creek and comes down with a huge crash. Another strong hen. This fish just would not quit and besides running almost into the backing it took me a good ten minutes to slide it up on the gravel. Conditions & Hatches Beautiful blue skies, no wind, 68 - 72 both days. Water was medium lever Monday and low today. Used 4X most of the time but went to 5X off and on. 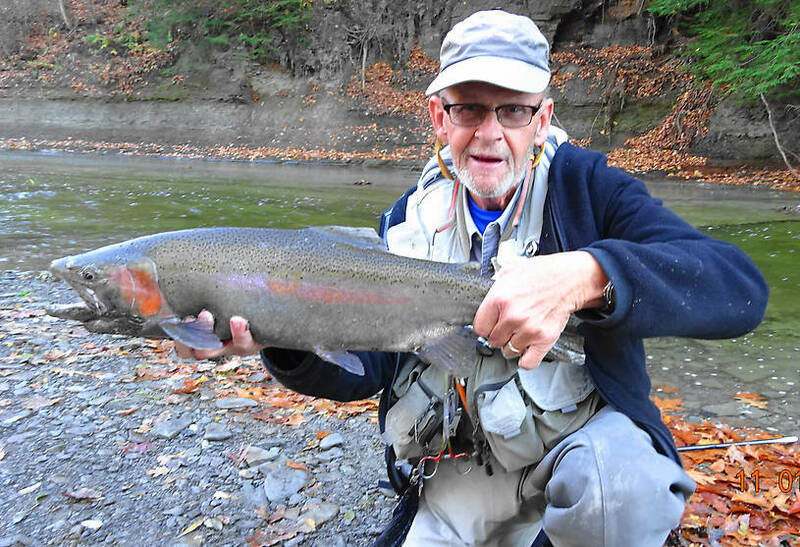 Posts: 2468 First steelhead trip of the season due to abnormally dry fall in Erie County, PA. Went with my two best buddies from New Jersey. We've been fishing together for 55 years. We probably hooked at least 50 steelhead and likely more. I hooked thirteen on Monday and another ten today and we only fished from 7:00 to !2:00. My buddies hooked similar numbers. I landed nine on Monday and six today. One of my buddies was particularly hot today and hooked sixteen. We would of stayed until tomorrow but there was just not enough water for another day's fishing. Here is a link to the Emerald shiner pattern. I tie mine slightly differently. Body - wrap thread to the bend, attach a piece of Mylar 1/16" wide an wrap to eye. Minnow belly - invert hook in vise or rotate vise so hook point is up, add a small clump of Ice Dub Minnow Belly. Upper wing - small clump of Ice Dub Pearl followed by a small clump of Ice Dub UV Gray, followed by a small clump of Olive Finn Raccoon. Eyes - Apply two very small eyes with black pupil, one to each side and apply a bit of Liquid Fusion all over the head. Rotate until dry. Posts: 2871 Nice work, Matt. And I've been stuck here with a stack of papers that have to be graded now. Can't wait until retirement! Hey, where do you stay in Erie? Geez, this makes me wonder if I should hit the Rifle tomorrow and look for steelhead and/or lake-run browns instead of launching the kayak again! That certainly looks like some nice water you have there. Not too deep and/or fast. 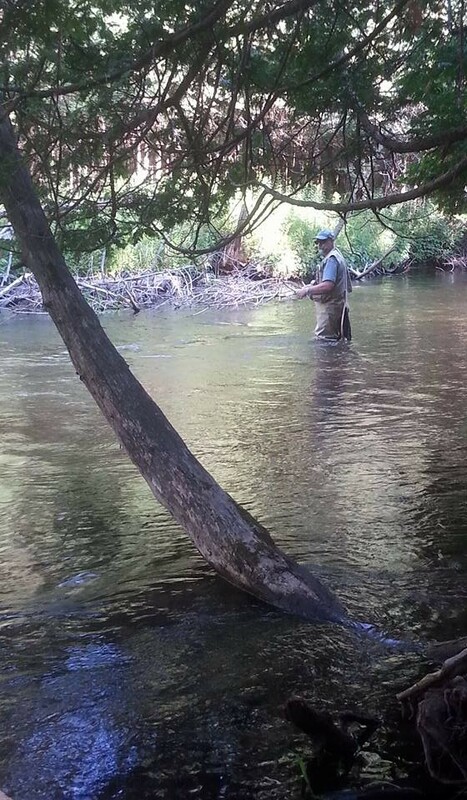 When they come into the Au Sable this time of the year I think they stick to the deeper (>10 feet) holes, not much fun to go dredging with a lot of weight on fly gear. Nice job Matt! So that's how its done...Hmmm?! I'd like to see that fly if you're willing to share...Are you talking mylar tubing like we may use for a streamer body? Posts: 287 Beautiful fish, Matt. The largest I ever landed was 25", and that was about four years ago, the last time I made it to the tribs. No, not the Mylar tubing that is used for streamer bodies. Gudebrod used to make this woven Mylar. But since Gudebrod went out of business a few years ago I don't know where to tell you to get it. It came in two widths; one about 1/8" and the other about 3/16". I used the narrower for smaller nymphs #14 - #18 and the wider for #10 - #12 nymphs. I've posted pictures up here before showing that wing case. I'll look to see if I can find a picture. I Googled "Mylar braid" it took awhile but I found this link. It is called "Flat Diamond Braid". I use the pearl for many of my nymph wing cases but you can use whatever color you want. 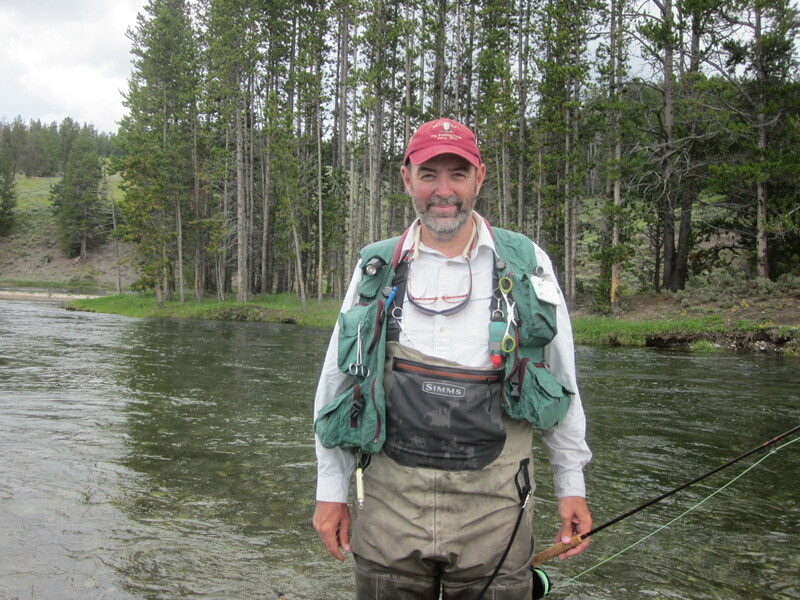 The other fly that was really very productive was a special tie of the emerald shiner. We were just casting it slightly up and across with one "B" split shot and let it settle down in the pools or pods of fish if we could see them. Often they would just hammer it as it drifted through the dark water. Very violent strikes. It is a complicated recipe and might be hard for me to put into words. When I have some more time I'll try to explain how it is tied. Here is a picture of many of my nymphs tied with the woven Mylar wing case. The pheasant tail nymph I used had a wood duck fiber tail, twisted pheasant fibers (4-5) wrapped around the shank and counter ribbed with extra fine gold wire. 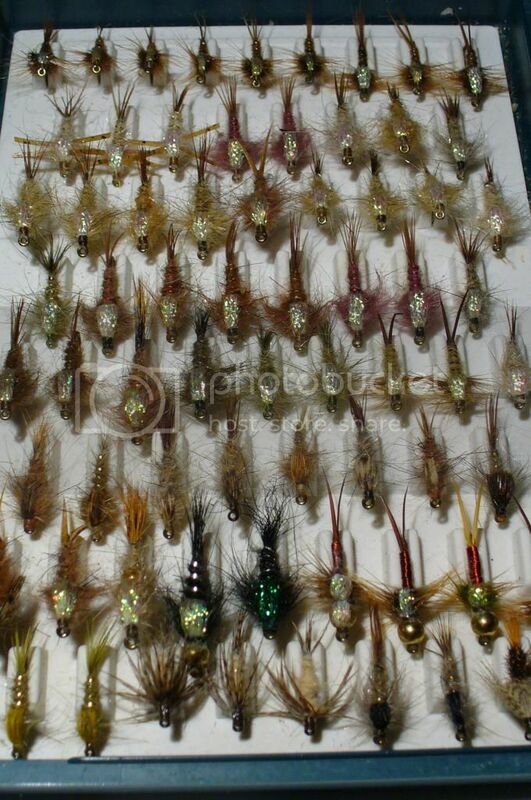 The thorax is a dense strand of peacock herl through which I wind a webby brown hackle, then pull the woven Mylar over the thorax and tie it off. A variant of this fly is adding a 3/32" or 1/8" gold bead. If you want to get creative try adding a "hot spot" in front of, or behind, the peacock herl. As I look closely at the picture I see the entire top row of flies are "flashback PT's" but these are all much bigger, probably #10 - #14. I know Diamond Braid. Interesting...I'll have to look it up, but I tried some dark nymphs, I saw on a website that were tied with this incrediblly shiny material that you cut fron a sheet of the stuff...It was used for the wingcase...It was a Steelhead Alley shop...DeFrank's Red-ribbed Flashback nymph. 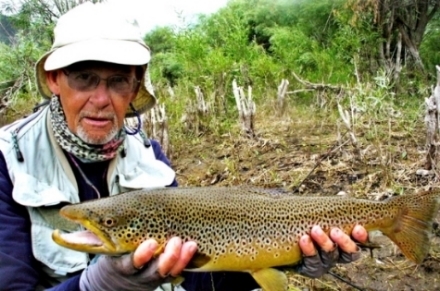 Nice fish and nice flies! And as always you're willing to share advice and tying tips...to which this novice can only say 'thank you'. My biggest steelie (to date, at least) was all of 16" when properly stretched- I've got some work to do here! I enjoy sharing my experiences with others and like to be able to offer some tips to get guys into fish. I've caught so many thousands of trout and hundreds of steelhead that I really enjoy seeing one of my friends catch some too. I've been blessed with so many successes and opportunities in my life that it would be selfish not to share what I've learned with others. If you ever want some info about fly tying, trout, or steelhead fishing feel free to send me a PM. I tied a bunch of those Emerald shiners and will post a picture soon. 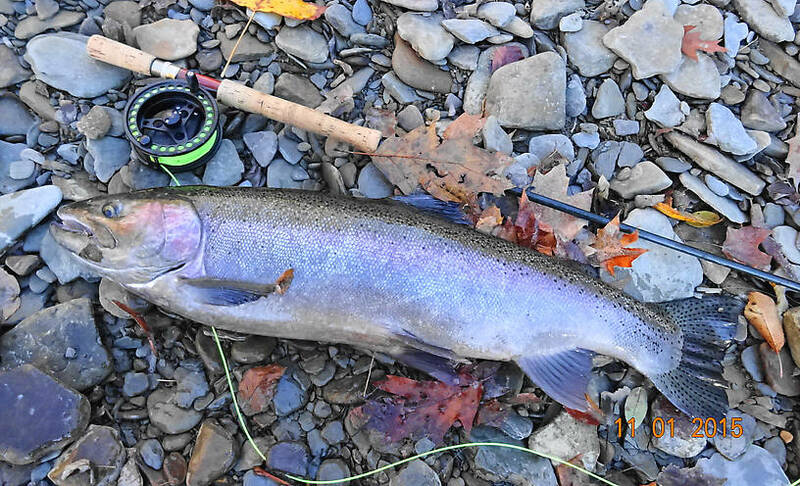 Posts: 2345 Rogue, don't feel bad, I've never caught a steelhead (at least not an adult!). I did, however, boat a 16" rainbow a few days ago - does that count? P.S. Again, nice flies Matt, and I look forward to seeing the emerald shiner pattern. This is 32" - look at the tiny head and really thick body. This fish was eating well in the Lake and is in almost perfect condition except for the clipped gill cover. 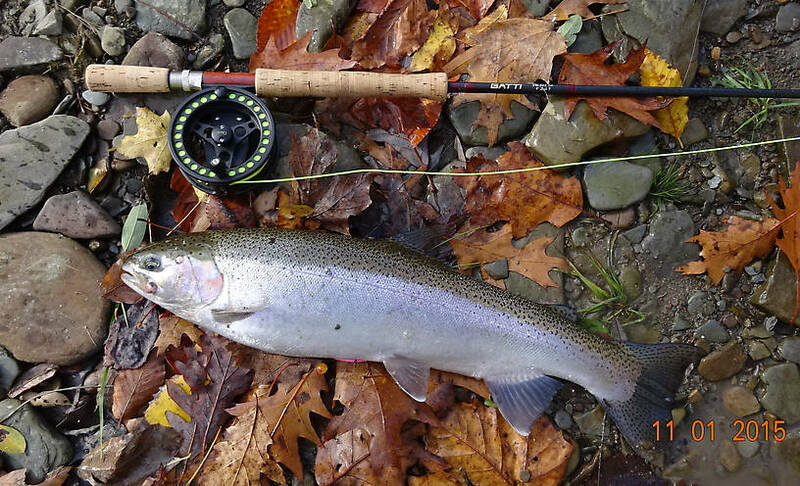 A really large resident rainbow (non steelhead) from the Salmon River. I would never gill a fish like this if I was planning to release it. The guy who took the picture wanted to have it mounted so I kept it. That was a long time ago. 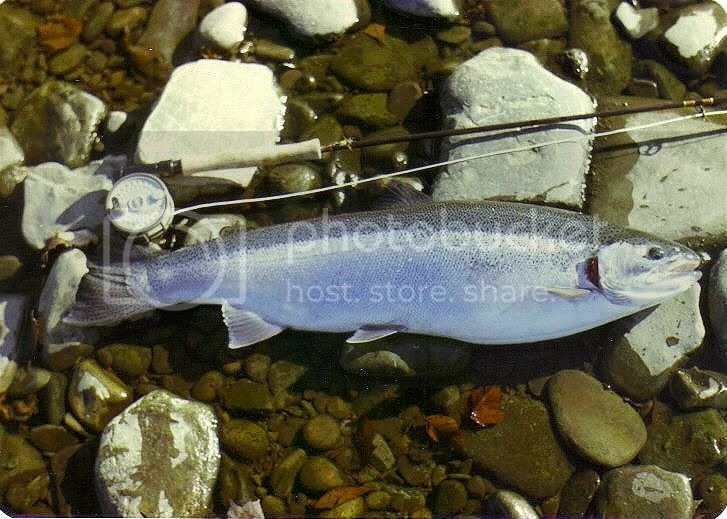 I've kept one steelhead for my wife in the last twenty years. Posts: 2587 That is one hell-of-a-Bow there Matt! Not sure they getting any nicer than that one. 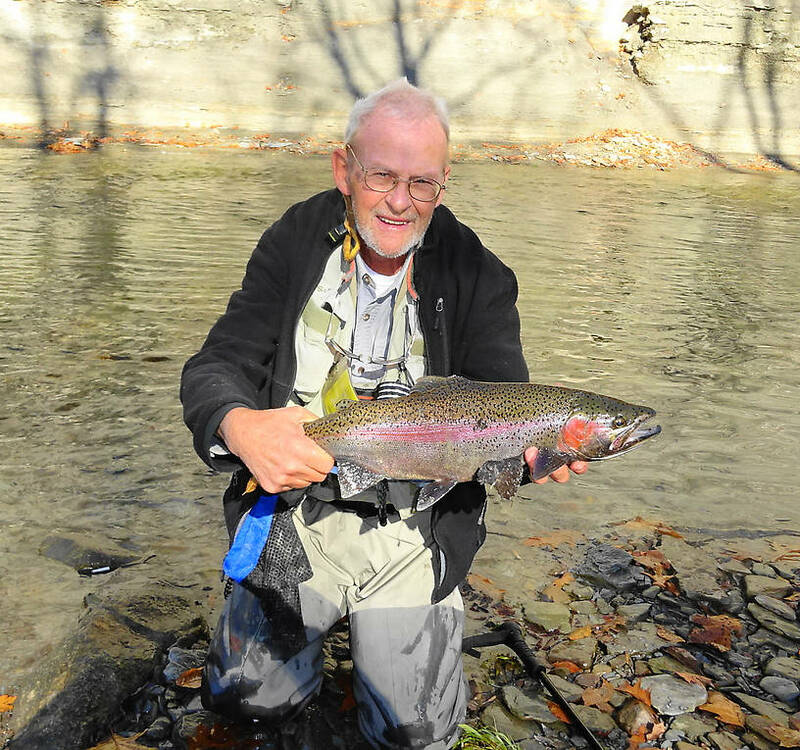 Posts: 2468 Yes, that is by far the largest non steelhead strain resident rainbow I have ever caught. As you can see it is very deep and thick bodied. I'd of guessed it to weigh about 9#. I'd estimate the length to be at least 27". What do you guys think? Nice fish, again! The rainbow is all of 27". I read somewhere that a thick-bodied fish with a small head is indicative of very rapid growth, likely from the forage base in L Erie. 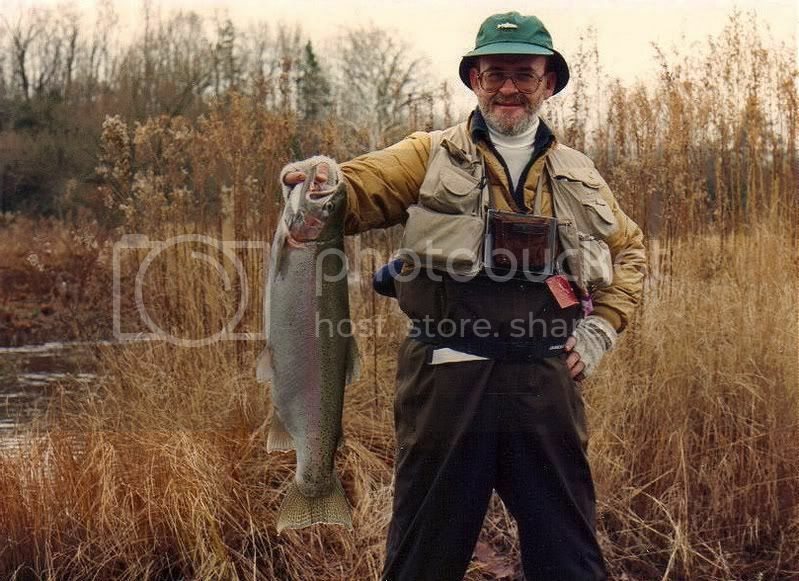 RE: the photo of you with the behemoth rainbow, are you wearing the classic 'up-downer' headgear? I've got one of these I still wear in the hottest weather since it keeps the sun off my ears and neck- too many melanomas over the years have me taking more care, although as a youngster I couldn't have cared less and have the damage to show for it. are you wearing the classic 'up-downer' headgear? Yes, they were my favorite fishing hat style for decades but it seems they are no longer being made - or I can't find a supplier. Yes small heads and big bodies is a sure sign of a young fish with a very good food source. Many of the rainbows I catch in the Delaware River have similar shapes. Posts: 2468 Do you want to know everything?????????? I'm surprised you never saw one of them on the Au Sable. It is called a "Richardson Chest Fly Box. They were originally manufactured by a gentleman named Rex Richardson who lived in Osceola Mills, PA. He bought the patent from the original inventor and improved on the original design many times and held the patent for decades. They were very popular with the Letort crowd including Charlie Fox, Vince Marinaro, Joe Humprey's and most of the other famous fly guys of the late 1950's on to the 1980's. They started out in just bright aluminum and canvas straps. I believe the first model had three trays and later a four tray was developed. I believe I have seen a five tray model and as few as two trays. When Mr. Richardson died a group of guys bought the patent and were making them up in Bellefonte, PA. I don't know if they are still being manufactured. I do know that they never answer emails. I had two of my own, a three tray and later a four tray. You could have any configuration of trays that you wanted. My four tray had one tray with no compartments, two trays with either 16 or 20 compartments 1.12" deep and the last tray was for big drakes and I think it was 1.25" deep and had 16 or 20 compartments. The bottoms of the compartments and the lids were closed cell foam so you could stick zillions of #14 - #22 nymphs and small dries in the lids. I bought one for my Da and when he passed I took it back. I used them pretty much every year until about 2006. By then I was 63 years old and always thinking about what would happen if I fell in while wearing the four tray. I would say I had between 500 and 600 flies in that box. If I fell in they would get all wet and I would have to spend a couple days drying them off and fluffing the hackles so they wouldn't get matted or ruined. I sold my first three tray for just $50 as the foam was shot and dry rotted and the straps were worn out. I sold my three tray Dad's box for $200 and sold my four tray for $250. I rarely see anyone wearing them these days. They kind of went the way of cane rods. Here is a link to the web site of the guys who were making them in Bellefonte. I said "were" because the web site looks identical to how it looked ten years ago so either they don't make any additions to their line of boxes or they are out of business. Matt, wonderful pictures, its days like that make all the no fish days worthwhile. 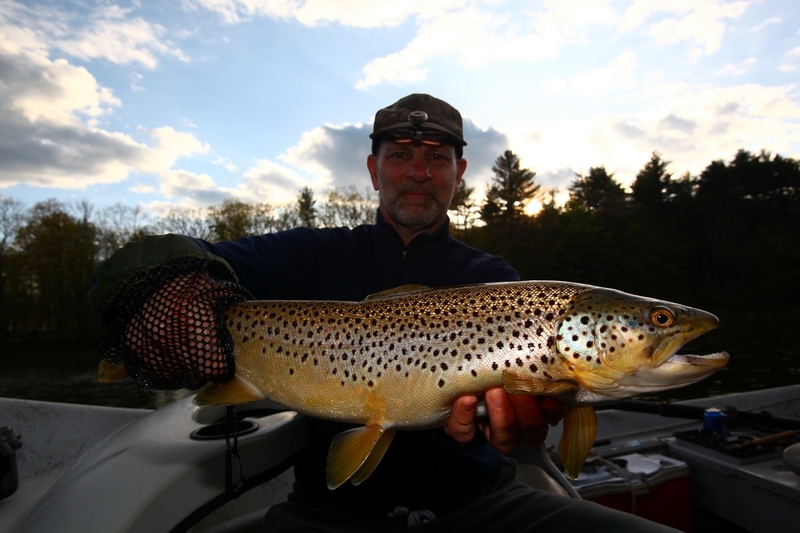 I had day like that on the ausable back in 1984, had 33 fish on and landed 11. And the weird thing was I wasn't doing any good on the springs wiggler, so tied on a Micky Finn for the heck of it, what wonderful memories. Mike. Do you want to know everything?????????? 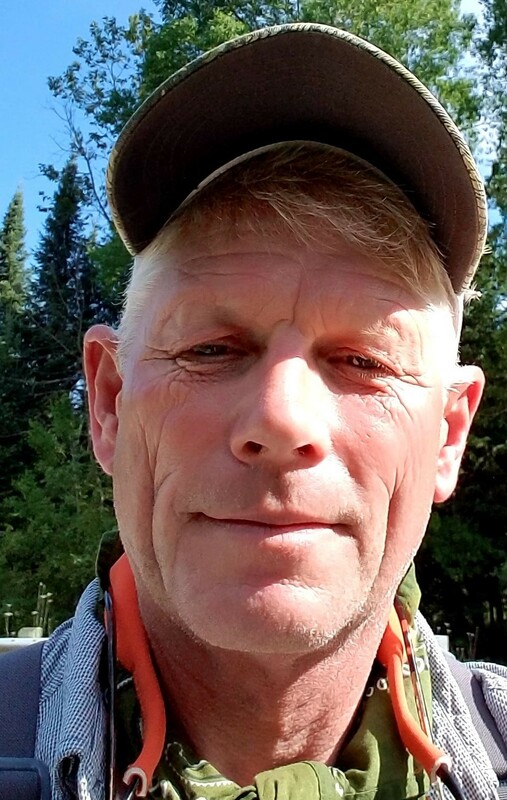 I knew what it was...Just wanted to have you share it with the youngsters here...Nice little bit of traditional fly fishing lore there you shared.